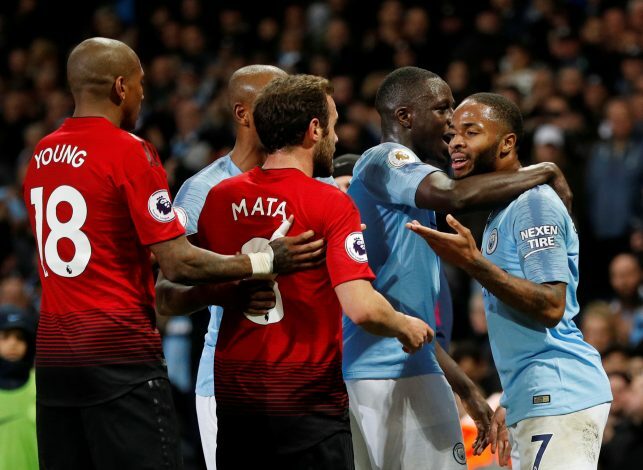 One wouldn’t have identified Sunday’s Manchester derby as a traditional one, save for the reactions of the Etihad, as Manchester City won 3-1 against their illustrious neighbors. The Sky Blues took home three points through goals from David Silva, Sergio Aguero, and Ilkay Gundogan, with Manchester United having only scored a penalty through Anthony Martial as consolation. However, towards the end of the fixture, there certainly were hints of City goading over yet another victory over their neighbors, with their ball-play indicative of their swagger. In the dying moments, the ball was passed quite well between Sterling, Sane, and Foden. Sterling, in particular, seemed quite happy with the way things were going about, engaging in step-overs and obvious acts of showboating. This wasn’t taken well by Juan Mata, who stormed over to the English forward right as he was about to take the game’s final corner, and made his displeasure at the youngster’s antics known quite well. Sterling, having signed a fresh long-term deal with the club quite recently, looked surprised at the manner in which the Spaniard approached him, and one does wonder whether he was even aware of what had occurred in his state of joy over City’s undoubted win. Interestingly, that wasn’t the end of the repercussions for Sterling either, with manager Pep Guardiola also having a word with him for his actions after the full-time whistle. The passionate manner in which Guardiola confronted Sterling, despite the win, has won him the respect of fans from both sides, thereby cementing his spot as an incredible gaffer. For the time being, bragging rights over Manchester are firmly in the Blue side of the city.